Bayview living for the urban family. 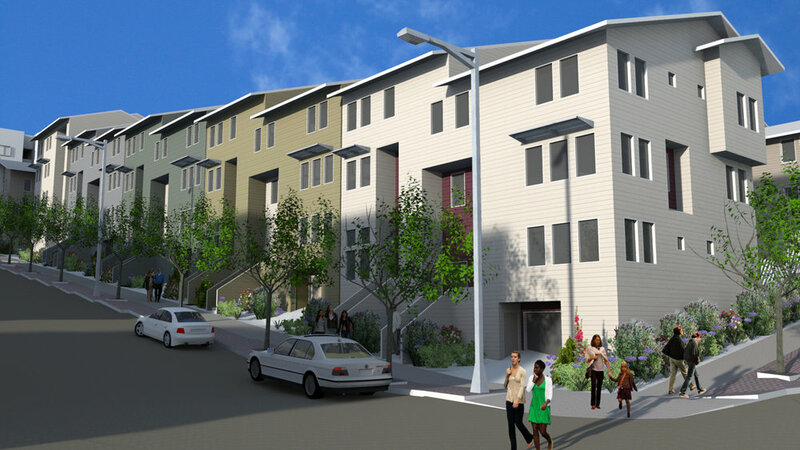 Located on a 3/4 acre steeply sloping vacant site at the intersection of Fairfax Avenue and Ironwood Streets as part the new Hunters View development in San Francisco’s Bayview District, thirty townhomes within duplex or triplex buildings are proposed for families with incomes up to 80% of San Francisco's area median income. The triplex buildings will consist of two adjacent townhouses over a first floor flat. Eleven percent of the units will be either visitable, adaptable or fully accessible units. Seven of the units will have two bedrooms and one and one half baths and twenty three of the units will have three bedrooms and two baths. The living areas for each unit will vary between 1100 square feet and 1700 square feet. Each unit will have a private patio or deck and will be solar powered. The buildings have been sited to take advantage of the commanding views of San Francisco Bay and beyond.